To transfer liquid steel from a teeming ladle to the continuous casting machine mould, an intermediate vessel, called a tundish, is used. Tundish is a rectangular big end up, refractory lined vessel, which may have a refractory lined lid on the top. The tundish bottom has one or more nozzle port(s) with slide gate(s) or stopper rod(s) for controlling the flow of liquid steel. Tundish is often divided into two sections namely (i) an inlet section, which generally has a pour box and where liquid steel is fed from the steel teeming ladle, and (ii) an outlet section from which liquid steel is fed into the continuous casting machine mould(s). Various flow control devices, such as dams, weirs, baffles with holes, etc., may be arranged along the length of the tundish. Longer path is preferred to prolong residence time of liquid steel to promote floatation of macro inclusions. Important tundish metallurgy elements of a tundish are shown in Fig 1. The continuous casting tundish serves as a buffer and links the discontinuous process of the secondary steel making in the ladle with the continuous casting process in the mould. It acts as a reservoir during the ladle change periods and continues to supply liquid steel to the mould when incoming liquid steel is stopped, making sequential casting by a number of ladles possible. The main causes for inclusion formation and contamination of the liquid steel include reoxidation of the liquid steel by air and carried over oxidizing ladle slag, entrainment of tundish and ladle slag, and emulsification of these slags into the liquid steel. These inclusions must be floated out of the liquid steel during its flow through the tundish before being teemed into the mould. In the past, when ladle metallurgy (ex. ladle furnace, LF) was not fully developed, the tundish was expected to function as a refiner of the deoxidized liquid steel transferred from the ladle where inclusions were not fully removed. Without LF processing, the deoxidized liquid steel had macro inclusions and a large number of micro inclusions of indigenous origin that could agglomerate to form macro inclusions during the liquid steel transfer. A tundish is able to reduce some fraction of macro inclusions from the Liquid steel, adjust chemical compositions, and control liquid steel temperature to an appropriate level for feeding into the mould. With the use of the LF and/or degasser, liquid steel cleanliness has significantly improved over the years to meet increasingly stringent customer demands, and the tundish is now seen more as a contaminator than a refiner. Appreciable contamination generally occurred during transient periods (or non steady state) of the sequential casting, i.e., during ladle opening, at the transition of two heats (or ladle change), and during ladle emptying. During transient periods, the incoming liquid steel stream and any liquid metal splash are heavily reoxidized by the ambient air and by the oxidizing ladle slag that is carried over into the tundish with the liquid steel. The liquid steel stream hits and aggressively emulsifies the ladle slag and tundish slag floating on the liquid steel surface, which eventually get entrained into the liquid steel. Both the reoxidation and the slag entrainment generate harmful macro oxide inclusions. The Al-deoxidized liquid steel, even after removal of large particles of deoxidation product in the LF, contains a large number of suspended fine alumina particles. These particles are found to agglomerate by turbulent liquid steel flow during the liquids steel transfer from the ladle via the tundish to the mould, forming large alumina clusters. The macro inclusions and large alumina clusters are known to be the major cause of downstream processing problems and defects occurring in strands and their final products. The steel plant customers usually demand cleaner steel with a smaller size of macro inclusions and clusters for better performance of the steel products. Accordingly, the design and operation of a tundish must be directed toward minimizing the formation of the macro inclusions and alumina clusters, and removing them once they form. Otherwise, all the efforts made in cleaning the melt in the LF and during other process steps are of no value. 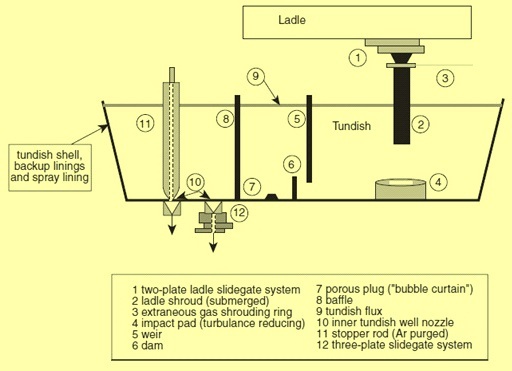 In its initial stages of development, the tundish was regarded as nothing more than a reservoir to hold sufficient liquid steel to provide a constant head over the mould, and to permit a ladle exchange to occur without interruption of sequence casting. With continuing emphasis on superior steel quality, it is now increasingly clear that the continuous casting tundish has a far more important function as a continuous reactor than originally envisaged. Tundish, which is all important coupler in the process of continuously casting high quality steel, has now truly become recognized as a critical metallurgical reactor. As such, it is a vessel in which a series of operations occurs that requires chemical, thermal, and physical control. Various technologies such as a long nozzle or an inert gas shrouding pipe have been implemented to reduce air reoxidation and slag emulsification. Similarly, melt flow control devices have been used to enhance floatation of inclusions formed during the process. Implementation of active control of the liquid steel temperature in the tundish has also contributed to casting of clean steel. These measures have proved to be quite successful, at least during the steady state tundish operation, but may not be sufficient for the non steady state operation. Non steady state operation is an integral part of long sequential casting for better metal yield. Although it is desirable to cast steel of high quality, a compromise between the quality and cost has always been struck in any tundish operation. The quality of the liquid steel delivered from the tundish to the mould depends highly on the degree and control of interaction of slag, gas and refractory phases with the liquid steel. A modern tundish is designed to provide maximum opportunity for carrying out various metallurgical operations such as inclusion separation, floatation, alloying, inclusion modification by calcium treatment, superheat control, thermal and composition homogenization, leading to the development of a separate area of secondary steel making of steel, referred to as tundish metallurgy. The continuous casting tundish has several roles which include (i) a critical link in the steelmaking chain of quality, (ii) a continuous refiner and (iii) a transmitter of metallurgical signals. The crux of the process remains that an uncontrolled tundish becomes a contaminator rather than a refiner. It is undeniable that the tundish is as much a part of clean steel practices as the ladle before it and the mould subsequent to it. If the quality built into the steel in the primary and secondary steel making operations is lost in the tundish, the ability to produce a quality product that meets the intended application depends wholly on recovery in the mould. This is a far more arduous task, considering the limited time that the steel resides in the confines of the mould, which provides a finite capability to cleanse the steel in the last stage prior to complete solidification. Many steel plant operators have studied their tundishes in order to maximize the benefits of the residence time available for the floatation and assimilation of reaction products from the liquid steel into the slag phase. These can be products of deoxidation, reoxidation, precipitation, emulsification and/or entrainment of refractory components into the liquid steel, and thus encompass both indigenous and exogenous inclusions. Based on a sound choice of tundish design, the operation of a tundish needs to be geared to the following. To offer the operator an optimal design for quality and yield. Elimination of contamination by air and/or refractory phases and technologies to support clean steel practices is part and parcel of sound tundish operations. Design criteria, modeling, tundish flow controls, slags, temperature control and cleanliness improvements, as will be non steady state operations are important aspects of tundish metallurgy. Once a tundish design has been finalized for a specific application, operators are in the position to maximize quality improvements when the tundish is regarded and operated as a continuous refiner. The operator needs to be cognizant that deviations from established clean steel practices can have disastrous results. With an emphasis on higher productivity rates driven by increased casting speeds, greater machine availability and improved product yield, larger and deeper tundishes have become the norm in the industry. This has provided a beneficial effect on steel cleanliness, as inclusion separation is generally facilitated in a taller and more volumetric tundish vessel, especially if care is taken that inclusions are not physically entrained to unnecessarily deep levels. Elimination of sources of molten steel contamination, e.g. refractory erosion, reoxidation, ladle slag carry over and tundish slag emulsification. Promotion of inclusion floatation and separation from the liquid steel by means of flow modifying devices (FMDs), filters, and engineered slag. Introduction of technologies such as thermal control, slag free transfer and optimized metal delivery systems to the mould. The role and functions of the tundish in the continuous casting process and its significance in producing clean steel casting are summarized below. The tundish links the ladle with the mould of a continuous casting machine. It accepts liquid steel from a ladle and delivers it to continuous casting moulds with minimum contamination, evenly and at a desired flow rate and temperature. The tundish is a refractory lined vessel consisting of an inlet and outlet sections and flow control devices, such as dams and weirs or a baffle with holes, along its length. A tundish may have a refractory lined lid, and has bottom ports that are assembled with slide gates or stopper rods through which the melt is teemed into the mould. Air reoxidation of the incoming liquid steel stream is prevented with the use of a long nozzle immersed into the liquid steel in the tundish or by a shrouded pipe with argon gas flow. The long nozzle and shrouded pipe also serve to reduce emulsification of the slag into the liquid steel. Flow control devices in the tundish increase the liquid steel residence time and help in reducing macro inclusions originating from air reoxidation and slag emulsification. At the same time, clusters of agglomerated alumina inclusions are reduced by floatation of these inclusions.